The chair of the House Intelligence Committee accused the FBI and Department of Justice of stonewalling a sprawling investigation into claims the Trump campaign colluded with Russia with the hope of running out the clock until the November elections, when they anticipate Democrats will regain control of the House and dissolve an ongoing probe that has uncovered evidence U.S. officials sought to cripple Trump's campaign. Rep. Devin Nunes (R., Calif.), in a wide-ranging audio interview with his House colleague Rep. Sean Duffy (R., Wis.), accused top officials at the FBI and DOJ of "putting all their chips on the Republicans losing the House" so that their Democratic allies can "shut down" the longstanding Intelligence Committee probe, which has unearthed information disputing claims of collusion in recent months. Rep. Duffy interviewed Rep. Nunes for an upcoming episode of Duffy's podcast, "Plaidcast." Nunes also lashed out at the U.S. media, accusing "90 percent" of reporters covering the Russia probe of being "essentially an arm of the Democratic party," according to an advance copy of the interview shared with the Washington Free Beacon. 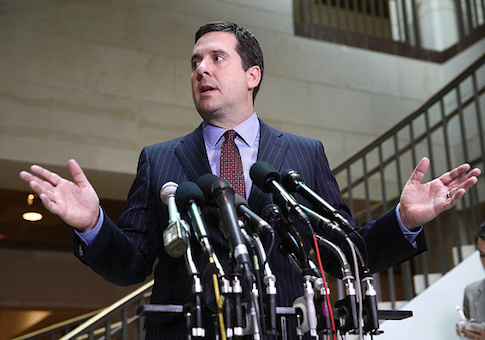 Nunes has been running the Intelligence Committee's investigation into claims the Trump campaign colluded with Russia to cement the 2016 election. The committee has unearthed a body of evidence indicating senior officials at the FBI and DOJ worked to take down Trump on behalf of Democratic challenger Hillary Clinton. "One-hundred percent, they [the FBI and DOJ] are putting all their chips on the Republicans losing the House and all these investigations will shut down," Nunes told Duffy. Nunes went on to blast the media for its lack of coverage about Republican findings indicating that senior U.S. officials loyal to the Democratic Party actively worked to open intelligence investigations into the Trump campaign based on a faulty and salacious anti-Trump dossier. "The media has been horrible on this whole situation," Nunes said." What we've seen since the election of President Trump has been what's been going on for a long time, but now you see what I call the 90-10 split." "You have 90 percent of the media who are essentially an arm of the Democratic Party," he said. "Then you've got five percent of the media that I believe, for lack of a better term, are right or center right. They don't necessarily follow the establishment of the Republican National Committee or something like that, but they definitely are conservative." "Then you only have five percent of the journalists that are out there that I would say are legitimate," Nunes said. "That's a problem in this country when you don't have a free and fair media." The Intelligence Committee's investigation has dragged on for months with little support from Democrats, who continue to push claims of collusion between Russia and the Trump campaign. "The DOJ and FBI have actively obstructed a congressional investigation," Nunes said, explaining that top officials continue to withhold documents that could disclose that both bodies intentionally worked to undermine the Trump campaign by opening secret investigations alleging Russia collusion. "This is really serious stuff," Nunes said, criticizing the FBI and DOJ for going to secret U.S. courts with evidence collected in the anti-Trump dossier, originally compiled by Fusion GPS. "They opened up a counter intelligence investigation into the Trump campaign." Nunes called the investigation into the Trump campaign unprecedented and an abuse of the American intelligence and security networks. "After seven or eight months of stonewalling, we realized they [the FBI and DOJ] had no intelligence in the opening of that investigation," Nunes told Duffy. In a different media environment, these revelations would have been front-page news, but have largely been ignored by the U.S. media, which Nunes views as working to oppose Trump at all costs. "If the shoe was on the other foot, and this is what's so bad and so corrupt about the media, and why I'm so worried about the future of our country, because without a free and fair and open media we have a major problem in this country," Nunes said. "The media is what we count on to bring the transparency to government. There's no possible way that if George W. Bush had done this to [former President Brack] Obama this town would have been on fire." "They would have had the FBI and DOJ surrounded by rioting in the street, everyone would have been fired, there would have been people put in jail, and what's happening now is, you essentially have obstruction by the Department of Justice and the FBI colluding with the Democrats to ensure that these investigations do not properly take place," he said. This entry was posted in National Security and tagged Donald Trump, FBI, Hillary Clinton. Bookmark the permalink.